Star Fleet Battles is still going strong today, but take a trip to the past with us. Expand the Commander's Edition from the 1980s with Volume II. 150 New Starships, including fleets for the new empires. Dreadnoughts, Scouts, NCLs, Fast Patrol Ships, and Minesweepers for all empires. New Weapons, including the Type "F" Plasma Torpedo, Tractor-Repulsor Beams, Gatling Phasers, Fusion Beams, Hydran Hellbore Cannon, Lyran Expanding Sphere, Minefields and the Displacement Device. New Battles - 3 solitaire scenarios, 6 new campaign games, and 21 other scenarios. 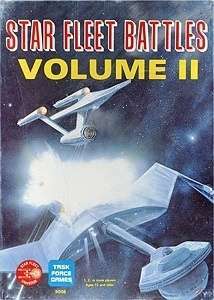 Star Fleet Battles Volume II replaces Expansions 1, 2, & 3 published previously. The rules of these expansions have been extensively revised and many new sections added. NOTE: This product adds new play situations and rules for the Star Fleet Universe. YOU MUST HAVE the Volume I of Star Fleet Battles Commander's Edition to use the material presented. This title was added to our catalog on July 10, 2015.